There is a lot more to Fieldskills than crawling around on your hands and knees covered in mud. Our qualified instructors run training days and longer training weekends at Ministry of Defence sites to give you a taste for skills necessary to operate and survive in the field. The training syllabus will teach you the tactical skills to operate during day or night in different conditions using various camouflage and concealment techniques. You will work towards building a skill set which will allow you to effectively observe movements in your environment, allow you to camp unnoticed and perform section manoeuvres in a team. This has always been a popular subject within the ATC as cadets relish the chance to get out of their “blues” and into their “greens”. 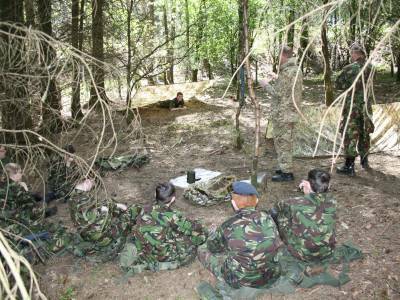 It also acts as a great starting point for those who wish to apply for more advanced courses such as Junior Leaders later in their cadet career.